ClassFileRecorder A simple interface that allows an implementer to control how class file metadata mapped to properties (including primary and mixin types) in the graph. ClassFileSequencerI18n The internationalized string constants for the org.modeshape.sequencer.text packages. 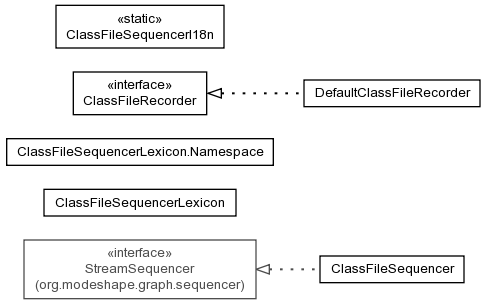 ClassFileSequencerLexicon The namespace and property names used within a ClassFileSequencer to store internal information.